The venerable Volkswagen Beetle is something Baby Boomers associate with the ‘60s. Mass produced by the Germans after World War II, the “people’s car” became a symbol for a generation, a symbol of peace, love, hippies and surfing culture. Possibly the world’s most recognizable automobile, the Beetle was a favorite of Adolf Hitler who had a few made for German elite. Designed by Ferdinand Porsche (yeah, that Porsche), the original design called “Type I” featured an air cooled rear engine and a trunk in the front. “Herbie, the Love Bug” was a popular Disney movie starring Dean Jones, Michelle Lee and Buddy Hackett and “Herbie,” the white Love Bug himself. A “Rolls-Royce” adaptation kit was sold to make VW Beetles look like the iconic British touring vehicle from the front. Advertising for the “ugly” car ranged from floating the tightly sealed car to an outline of the iconic lines of the car. When my husband and I were engaged, we decided to replace his ’73 LeMans. On the way to the used car lot to get the “new” car, he wired the tailpipe of the aging LeMans with a coat hanger to keep it from dragging the ground. It was certainly time for a new car. I co-signed the loan. He picked out the car and then we went together to see what he bought. 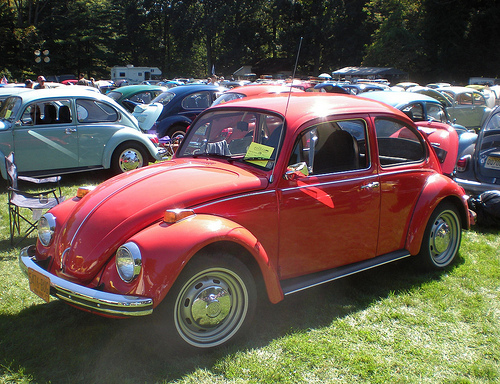 He chose a ’73 red Volkswagen Beetle at a cost of $500. This was just the beginning of the love-hate relationship with the car, which we named “Edna Boom-Boom Garrett” (for reasons I don’t remember.) My grandmother lived in Clearwater and one night My Beloved picked her up at the Ye Olde Double Wide Trailer Park and brought her over to our apartment for dinner. Edna took My Beloved to work on heavily-traveled Pinellas County streets. She was a magnet for old drivers in large vehicles, who were aiming to ruin someone’s day. On two days – a week apart on Belcher Street – Edna was smacked and dented by large American sedans with elderly drivers. Each of those repairs cost $500. Anything that went wrong with that car cost $500. No questions asked. Dents. $500. New transmission. $500. Wash and set. $500. We moved to Tampa for My Beloved to go to graduate school and Edna came with us along with our “good” car, a 1981 Chevette. The Chevette, not air conditioned and unadorned, was our good car because of its newness. Our fortunes improved after we moved to Tampa and we sold Edna to buy a used Volvo. Wanna guess how much we sold her for? That’s right, $500.